January 31st, 2015, Filming began for a new martial arts training video at the Arizona School of Traditional Karate. This video focuses on the use of a traditional Okinawan martial arts weapon known as bo - a six-foot long staff that is commonly used by SE Asians for transporting goods across their shoulders. The bo is a very effective weapon developed by Okinawan farmers for self-defense along with karate. Students at the Arizona School of Traditional Karate (aka Arizona Hombu) took up the blade (samurai sword) and trained on pumpkins as an annual event for Halloween and Thanksgiving. The group all had the opportunity to practice cuts with the samurai sword using many donated pumpkins. April 12th, a group of senior martial artists from Murray, Utah traveled from Salt Lake City to Phoenix Sky Harbor airport to train at the Arizona School of Traditional Karate and Seiyo Kai martial arts facility in Mesa and Gilbert, Arizona. The group from Utah included Kyoshi Watson, 8th degree black belt and Renshi Stoneking, 6th degree black belt of the Utah Shorin-Kai. The group trained in advanced Okinawan Karate Kata (forms) that included many devastating self-defense applications against a variety of attacks. The group also trained with hanbo (law enforcement night stick, or 3-foot club) along with restraints and also in traditional Okinawan kenjutsu (samurai sword). The three day clinic was taught by Soke Hausel, 10th degree black belt and Hall of Fame martial artist from Arizona. Patrick Scofield was promoted to gokyu (green belt) and Ryan Harden was promoted to sankyu (brown belt) at the Arizona School of Traditional Karate in Mesa and Gilbert, Arizona after demonstrating several kata (forms), kobudo (weapons), and self-defense against armed and unarmed attackers. 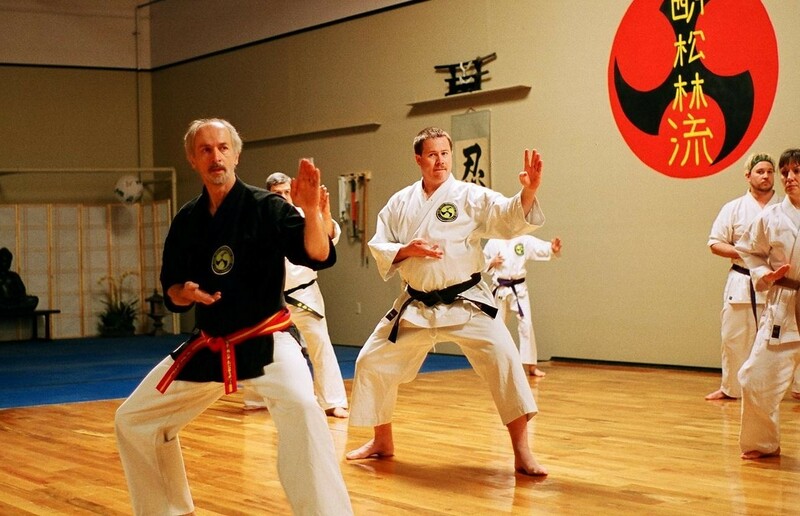 The above photo shows Ryan Harden (right) training with Shihan Adam, 5th dan. Within the East Valley of Phoenix, the Arizona School of Traditional Karate (also the world headquarters for Seiyo-Kai Shorin-Ryu Karate and Kobudo) located at 60 W. Baseline Road in Mesa (near Country Club Road) welcomes visitors. The Arizona School of Traditional Karate is a traditional Okinawan karate school with typical Japanese décor. Stop by and see us and see why we have so many dedicated members. In the upcoming weeks, we are planning several clinics and events along with our normal class schedule. The majority of our classes are geared towards teaching adults in self-defense and the traditional art of Shorin-Ryu Karate and Kobudo, but we also teach Japanese samurai arts. We also have an award-winning kids karate class, but this class is restricted to a handful of students who have first trained with their parents in the family classes. In the upcoming weeks, we are looking forward to visitors from the Utah Shorin-Kai who will train at our school under Professor Hausel and study Okinawan forms and self-defense applications. The group will fly into Phoenix on May 28th and train for the next few days in Mesa. This will be followed by a special clinic for non-martial artists – the general public is invited to learn self-defense at our school in Mesa on Saturday May, 7th as Hall of Fame martial artist, Soke Hausel teaches the public another use for their knees, elbows and even car keys. Soke Hausel is well known for clinics taught to the public. He was awarded the North American Black Belt Hall of Fame’s 2001 International Instructor of the Year and the American Karate Association’s Hall of Fame 2004 Instructor of the Year. Another clinic is scheduled on the weekend of May 14th, when members from Colorado, Nebraska and Wyoming will train under the Hall of Fame martial artist in Okinawan Yari (spear) and Kotekikai (body hardening). This clinic is only open to members of Seiyo Kai International. This will be followed by a visit from the Police DAV karate team from India who are heading to Mesa to train in martial arts. Last week, two members of the Arizona School of Traditional karate tested for rank advancement, while other members from Utah, Wyoming and Vietnam also tested for rank and were promoted by Soke Hausel. In further news, the Hombu in Mesa was rated as having the TOP-RATED KARATE classes in the Phoenix Valley. Students attending the Arizona School of Traditional Karate and the Seiyo Kai Hombu in Mesa are treated to traditional Okinawan décor in the Mesa martial arts center. As one walks into the dojo, the school is similar to what one would see in some training halls in Okinawa. The school also focuses on adults and families rather than kids’ karate. Thus adults learn to defend against one another instead of training along side of 5 year old children. In this way, adults can learn basics of karate and much more complex advanced techniques (>150 black belts have trained under Soke along with hundreds of other students). Kids are not neglected, but to participate in the Kids’ Karate Class, children must attend family classes with their parents and later be invited to attend the Kids’ Karate class. Parents who have their kids in this class are impressed by the training – the children are actually taught karate and kobudo rather than games, and they are also required to learn respect and Japanese. Unlike many other schools in the valley where adults may be taught by teenagers, nearly all of the classes at the dojo are taught by the Soke. Many self-defense classes and clinics are taught to martial arts students and to the general public by Soke. Soke is a term meaning world head, president or grandmaster; thus Soke is the highest ranked martial artist in the world in Shorin-Ryu Karate (Seiyo-Kai). He has 8 different black belt ranks and is a certified 10th degree (judan) black belt in Okinawan Shorin-Ryu Karate and Kobudo. As a result, the students (deshi) get access to Soke’s 46 years of experience in martial arts. Furthermore, Soke has certifications in nearly 2 dozen martial arts – so one will not get bored while training at his schools because there is lifetime of martial arts experience to draw from. The overachiever has been inducted into 15 Halls of Fame for his accomplishments and is a member of dozens of Who’s Who. Soke is also unique in that he was awarded the title of kyoju (Professor of Martial Arts) due to 40 years of teaching at four Division 1 universities. He was also awarded the 2001 International Instructor of the Year, the 2004 Instructor of the Year and the 2000, 2002-2005 Soke of the Year by several major international martial arts associations. He was awarded the President’s Award in 1992, the 1994 Distinguished Speaker and 1998 Distinguished Lecturer awards. In 2006 he was awarded an Honorary PhD in the Philosophy of Japanese Martial Arts Sciences.